Are you still holding a trigger squeeze sprayer to water your yard under the hot sun? 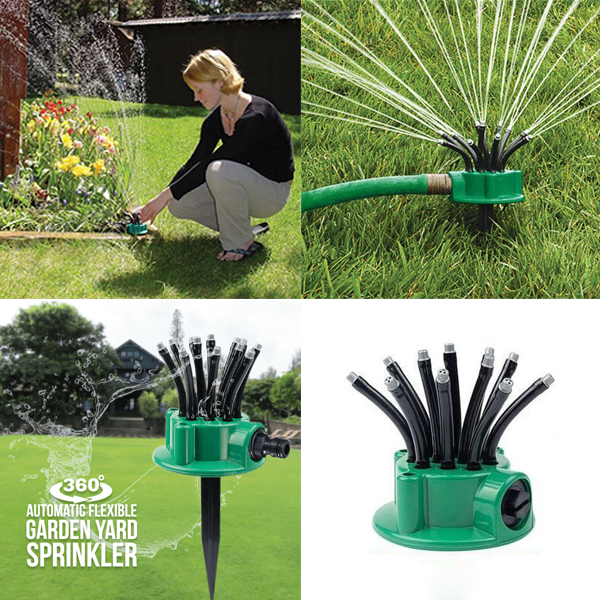 You need this 360 Degrees Adjustable Lawn Sprinkler to help you. With 360-degrees and automatic watering design, it makes watering your garden easier and enjoyable. It features a wide coverage with high efficiency, and suitable for watering lawns, yards, flowerbeds, gardens, patios, etc. The Lawn Sprinkler is made from Acrylonitrile Butadiene Styrene + Polyvinyl Chloride, and designed so that you control the spraying of only that which you want watered. It will help conserve water by not spraying streets, sidewalks, buildings, windows, people or cars. No more brown spots in your lawns, it adapts to any shape or pattern you can imagine. Suitable for Watering Lawns, Yards, Flowerbeds, Gardens, Patios, etc. Simply connect your hose to the sprinkler. Next, place the sprinkler on the ground wherever you’ll want it to be. Adjust the sprinklers hoses as desired and turn on the tap. We truly believe we have some of the most unique products in the world, and we want to make sure we back that up with a risk-free ironclad 14 day guarantee. we will do WHATEVER it takes to make sure you are 100% satisfied with your purchase.